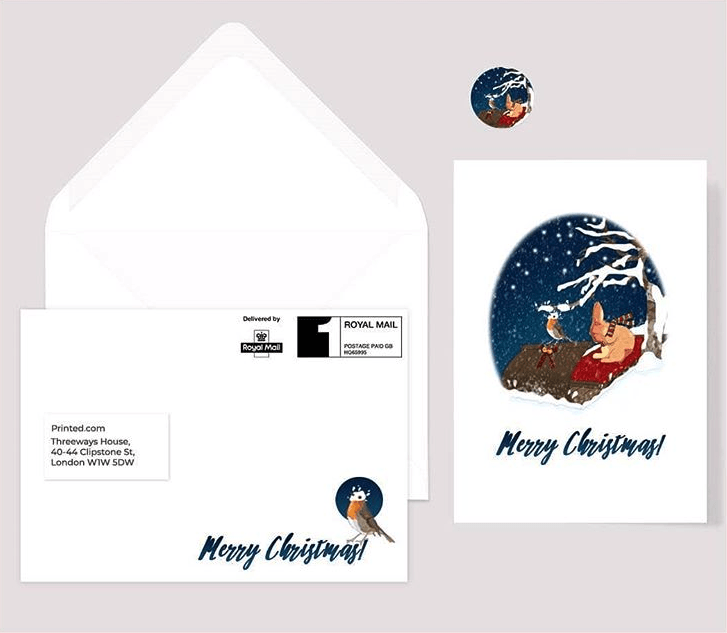 To celebrate the festive season we offered one lucky customer the opportunity to design our Printed.com official 2018 seasonal Card, Envelope and Sticker. 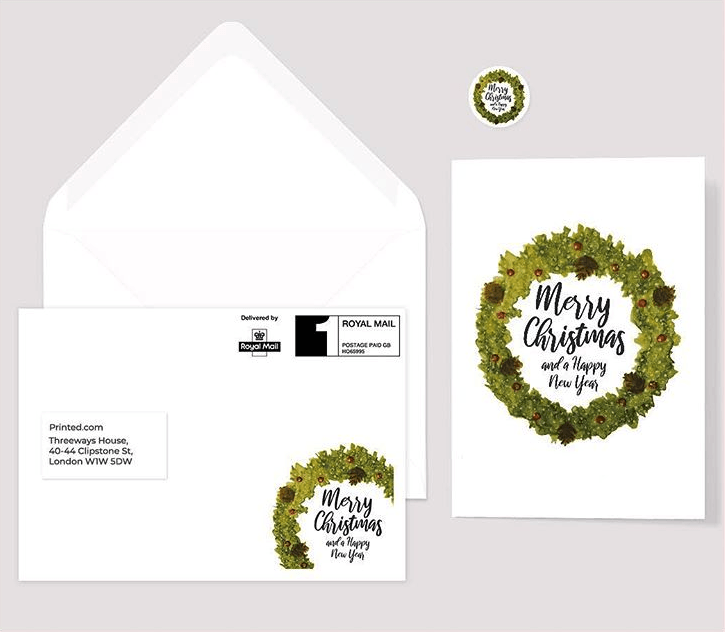 Not only will the winning design get into the hands of Printed.com customers and printing partners, but as this is the season of giving, we’re offered £1,000 worth of Printed.com points to gift to our winner’s chosen charity. 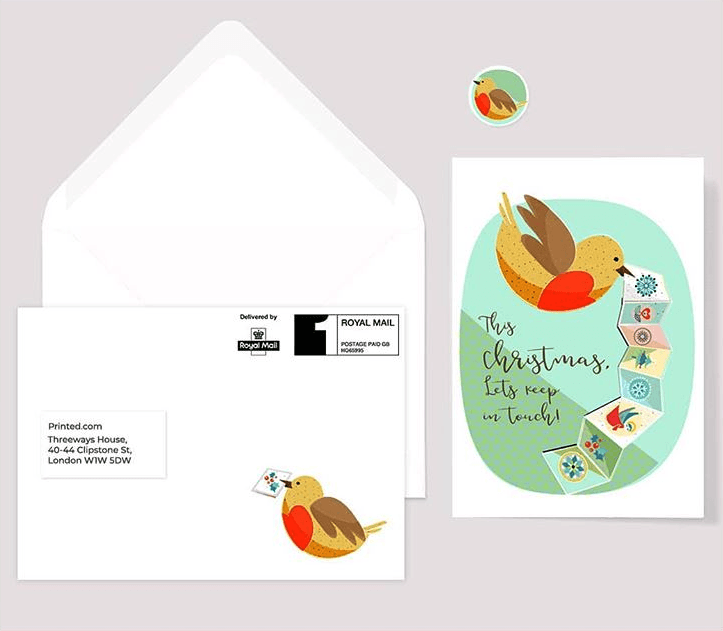 After receiving an abundance of entries, and much deliberation, we chose our winner – Clo’s Line, with her adorable ‘Where’s Jolly’ Greeting Card Design and LittleBird Weddings as our runner up. But, with so many great entries, we couldn’t stop there. So, we’ve rounded them all up right here for you! 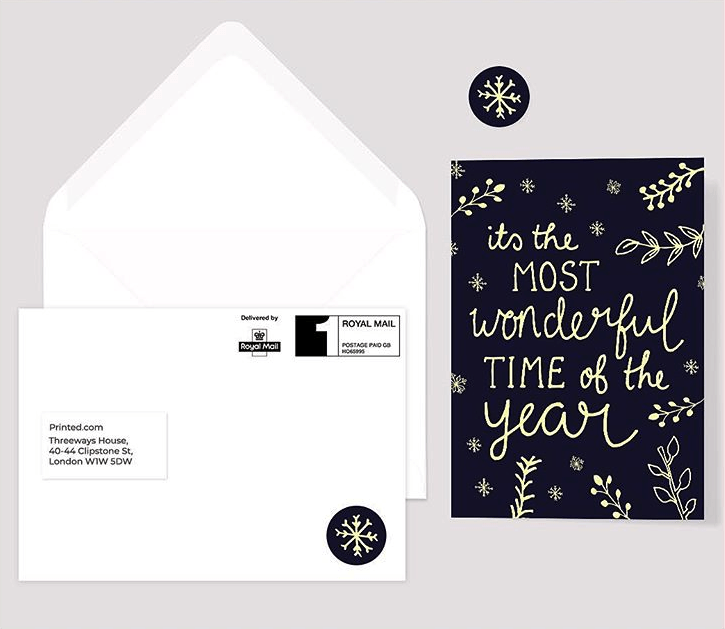 If you’re not already feeling festive, you will be after taking a leisurely scroll through these gorgeous designs! Nothing says ‘Christmas’ more than a wreath and we love this simple yet striking design from DH Creative Arts. This design was created for Mind Charity. 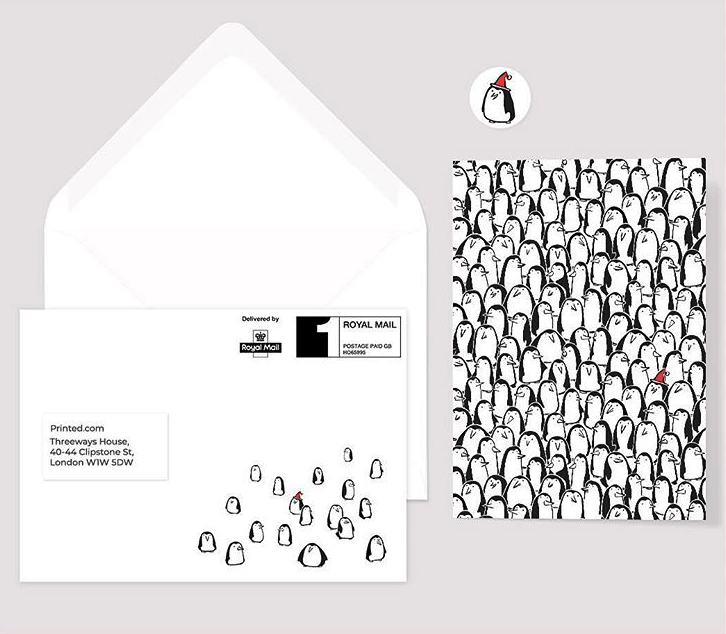 This design was inspired by ‘Where’s Wally?’ (or in this case… ‘Where’s Jolly?’) and was created in aid of Social Bite, a charity that’s on a mission to build a collaborative movement to end homelessness in Scotland. 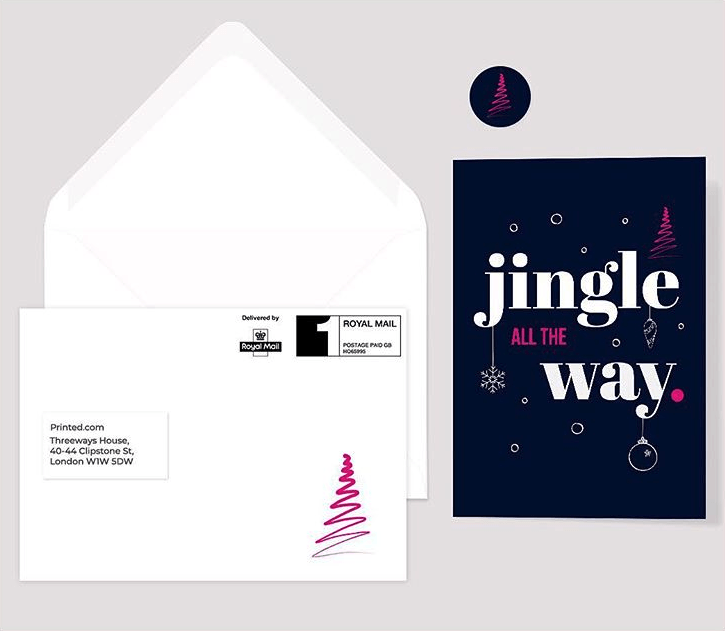 Aim Designs got us feeling all festive with her ‘Jingle All The Way’ design, designed for Cynthia Spencer Charity. 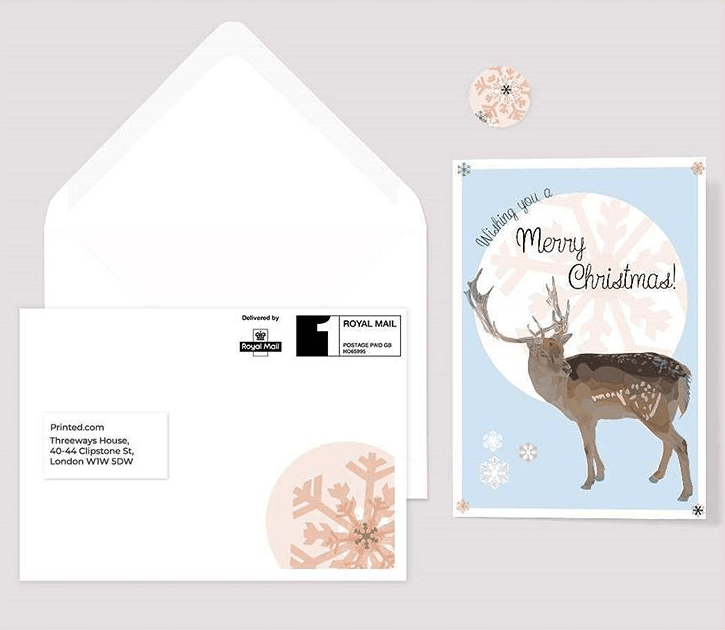 Louisa Thorne’s adorable deer design ticks all the boxes this Christmas, we just love the snowflake details too! It was created in aid of the wonderful Helena’s Hospice Foundation. Designed for The British Heart Foundation, this design comes from the heart, as Courtney Blades was born with congenital heart disease herself. 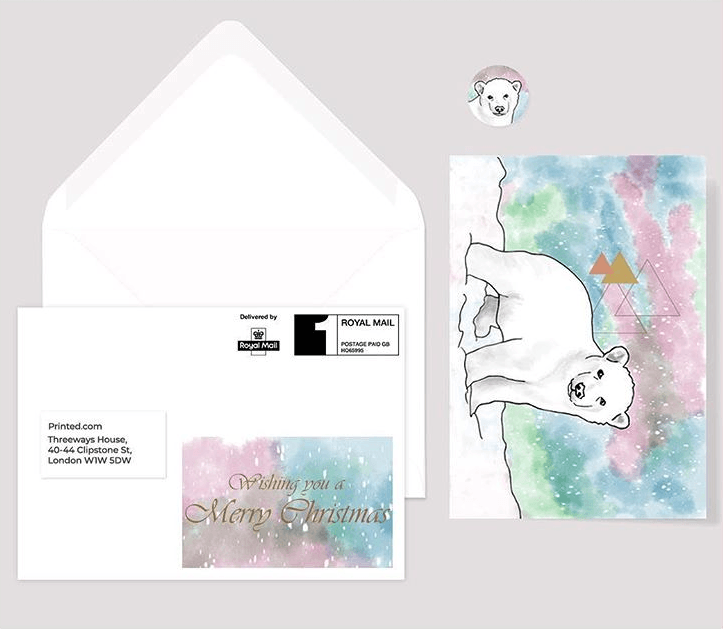 Not her usual gorgeous Wedding Invite style, but wonderful nonetheless, this cute bear card was created by I Do Invites for Birmingham Children’s Hospital. Mencap Letter and Lines Art should be proud of this fabulous design! 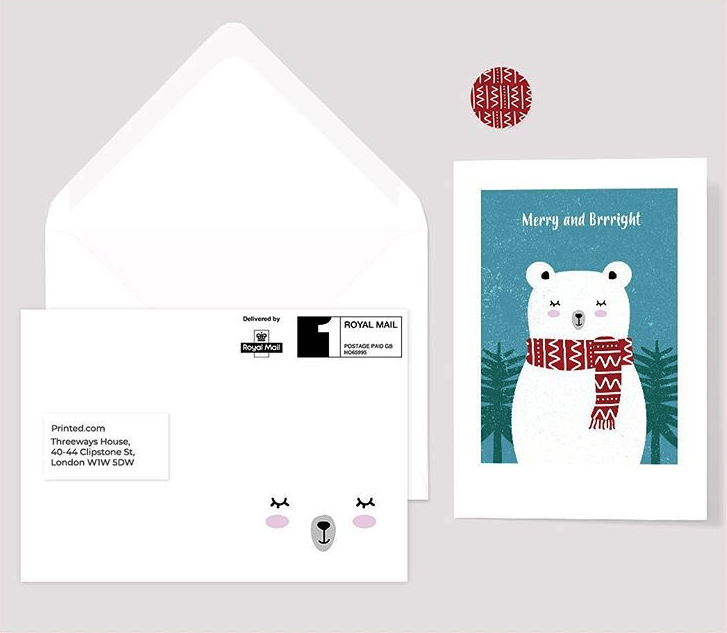 This Christmas, lets keep in touch! What a lovely message, and it’s in aid of Young People Matter. 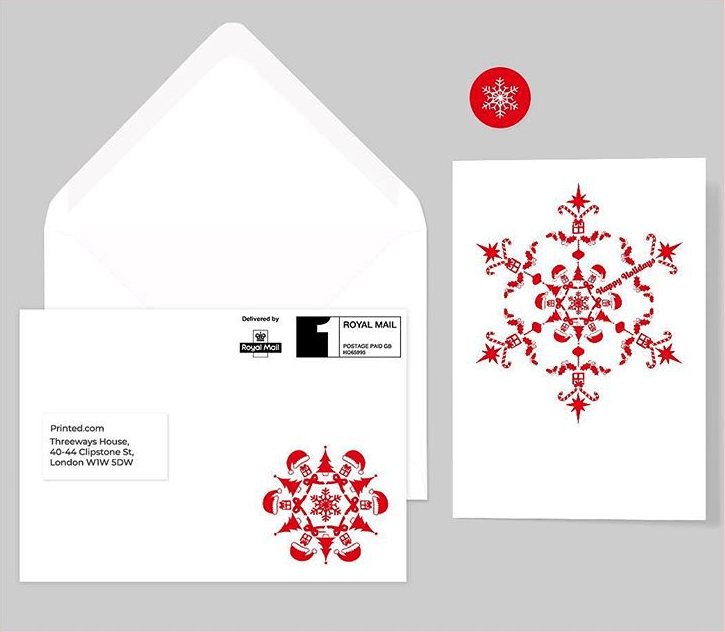 Who doesn’t love snowflakes made from Christmas symbols? Yup, look closer, that’s not just any old snowflake! It’s made up of Santa hats and candy canes, trees, ribbons and gifts! How cool?! This one’s for ME Association too. 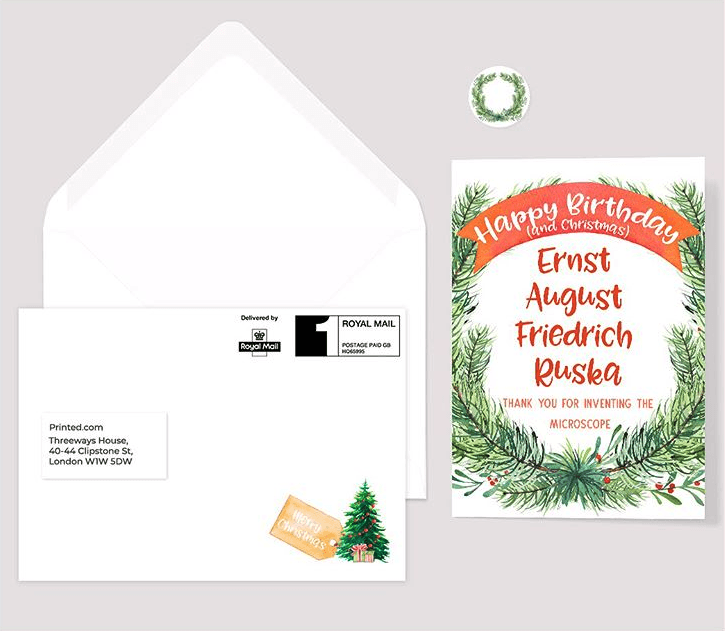 Happy Birthday Ernst August Friedrich Rusta, and a Merry Christmas too is the message behind this Card from Blooming Lovely Designs. 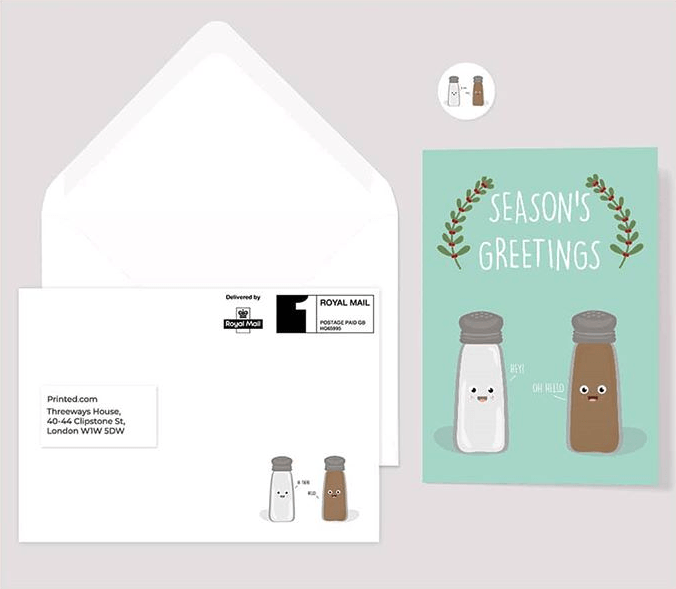 Celebrating the birth of the electron microscope in 1928 these cards highlight the importance of this essential tool in the advancement of modern science. ValleyHouse.org.uk are the charity that Blooming Lovely Designs chose too – they’re a local charity based in Coventry. They house Teenage Parents and Domestic Violence sufferers. 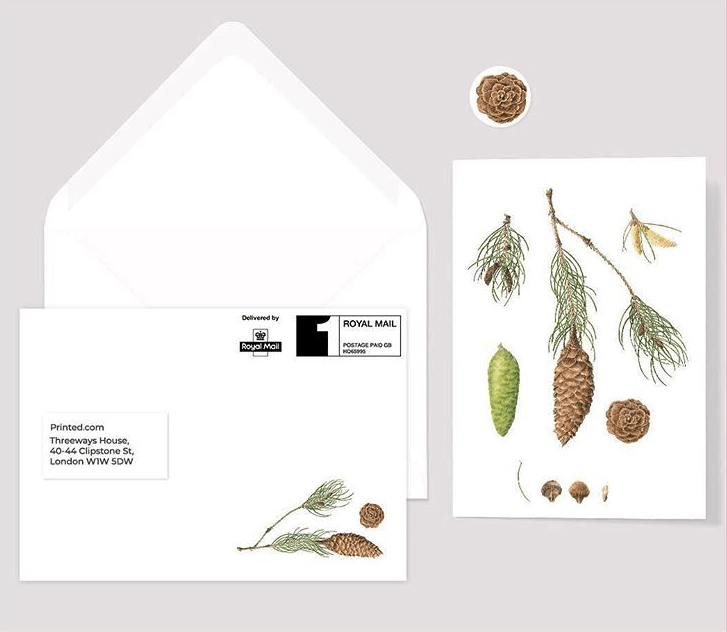 Something a little different adorns these Cards from Tracy Botanical Illustration – Picea smithiana West Himalayan Spruce to be exact! They were designed for Maggies Oxford. 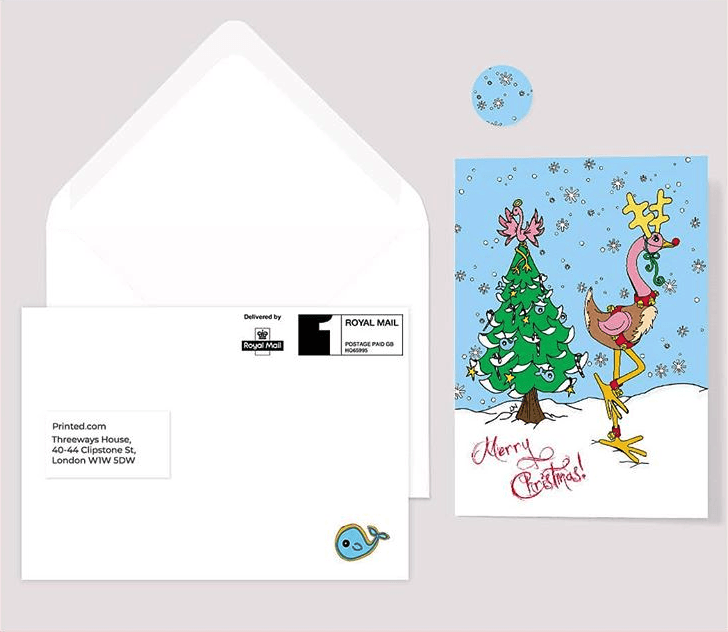 For one card and one card only, Squaire’s going rectangular in the name of charity! 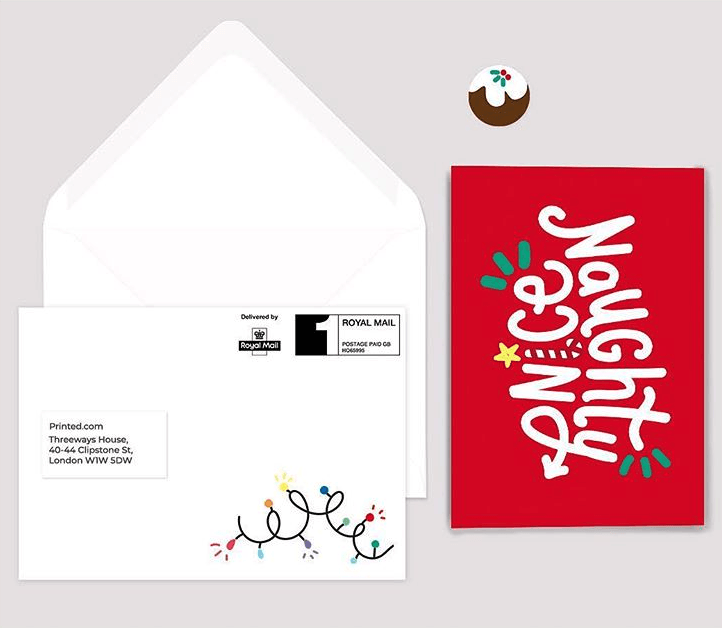 You might need to turn your head though as this card is designed to let the recipient decide if they’ve been naughty or nice by which way up the card goes. It was created by Squaires in aid of Alzheimer’s Society. We love the modern feel of this entry by Cutie and the Feast. 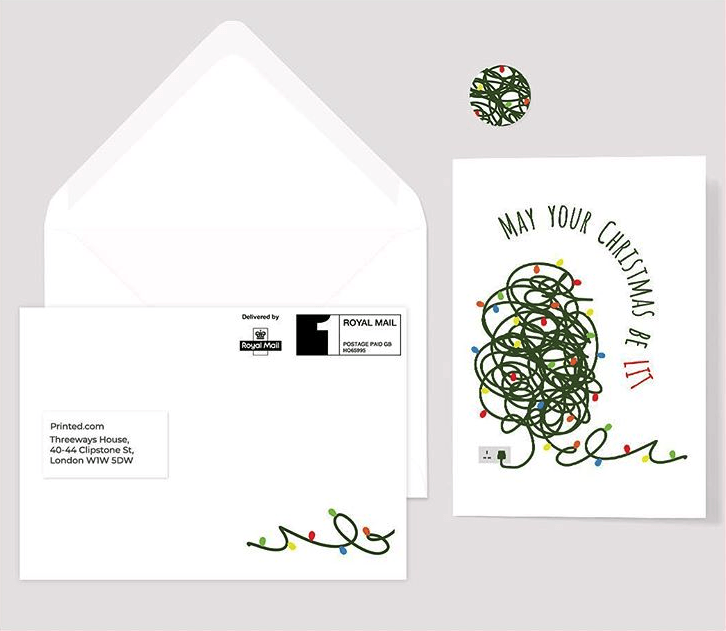 Simple, yet bold and effective it has Christmas written all over it! (Well, not literally). It was designed in aid of charity Love, Jasmine who offer support to bereaved families who have lost a child. They are a small charity working really hard to help in the most difficult of times. Hold on, we’ve seen that name before, right?! I Do Invites entered our competition twice this year, and this is the most tropical entry we recieved! 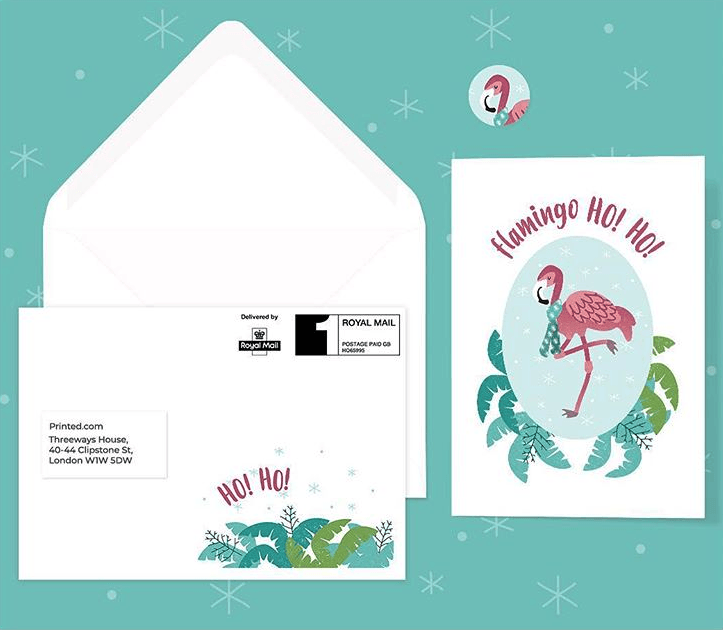 Flamingo Ho Ho right back at cha! 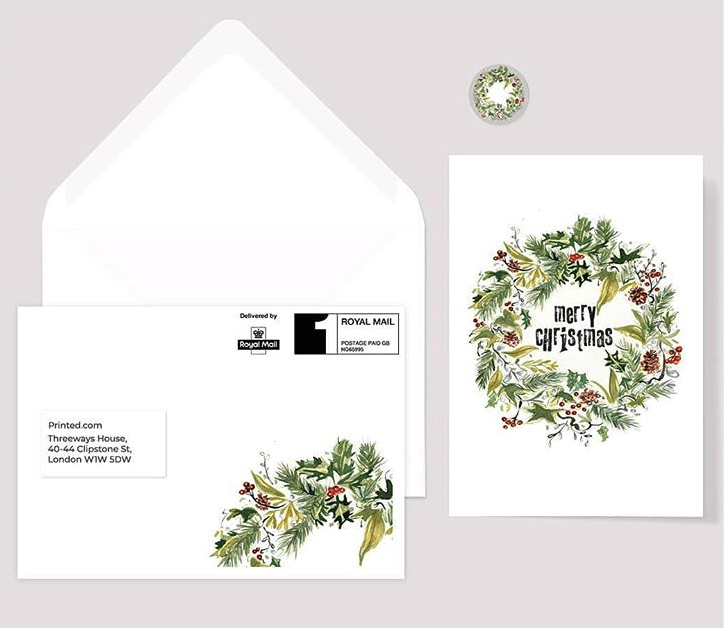 The printed.com elves have been busy printing hundreds of cards ready for delivery in Emma Lawrence’s design! Her Card was created on behalf of he Lingen Davies Trust who are trying to reach their fundraising target for their 40th anniversary. They make a positive difference to those affected by cancer. 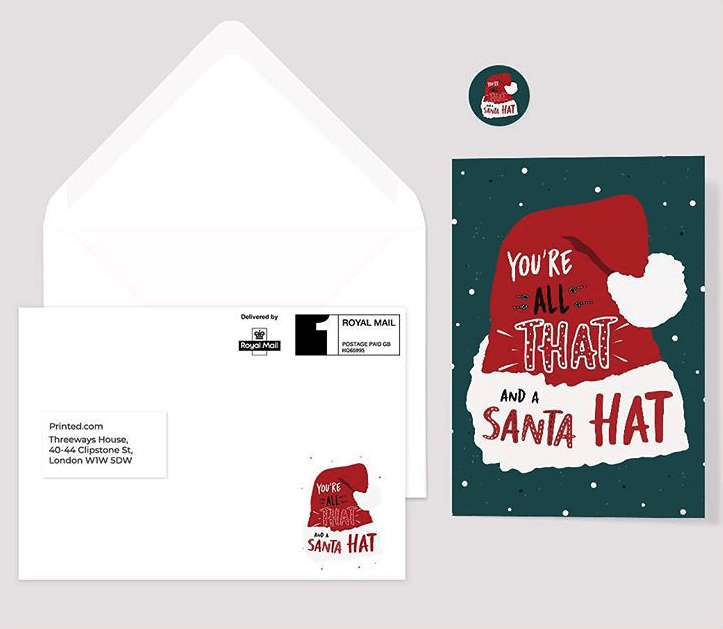 We adore the fun message behind this one from Foggish – You’re all that and a Santa Hat! 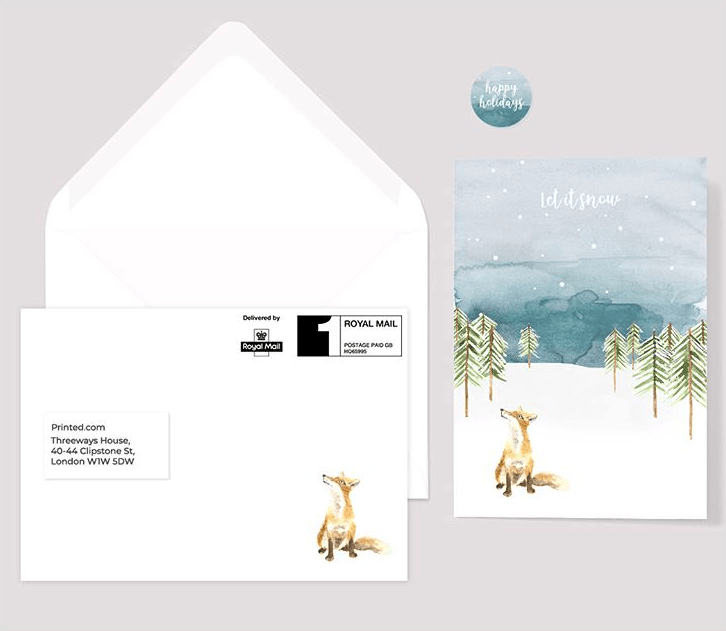 Niomi designed these cards for Age UK – and if you like this one, you should definitely go check out her other work too! In aid of Cancer Research, these cute little fellas would look great propped on the mantelpiece this festive season. 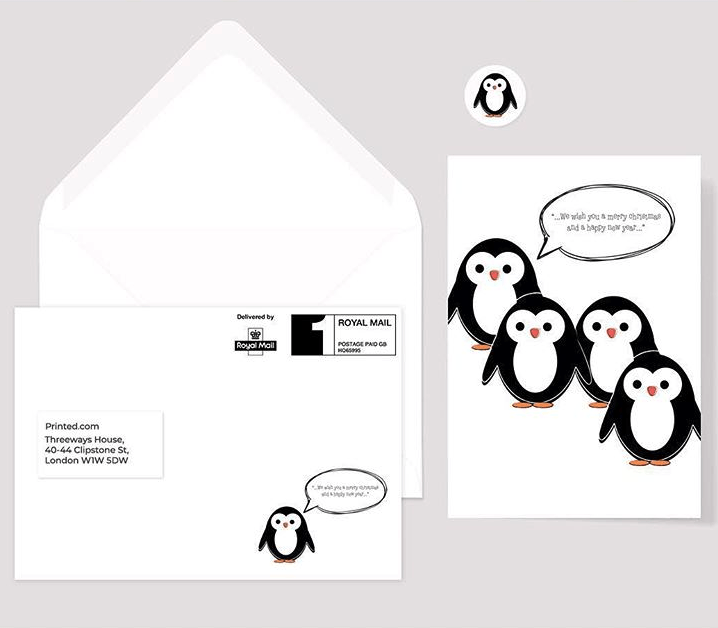 We think the adorable penguin design looks awesome as a sticker too, how sweet! What do you get if you cross a reindeer with a flamingo? Well, we’d never actually thought about it, but it’s clear that Walter and Flo have! These fun cards were designed for Guide Dogs UK. 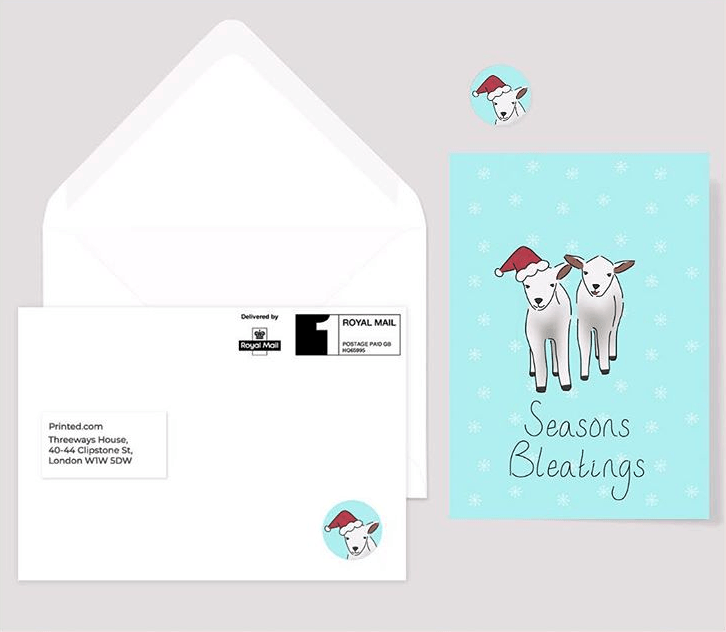 Seasons Bleatings from Michaela and these little lambs! 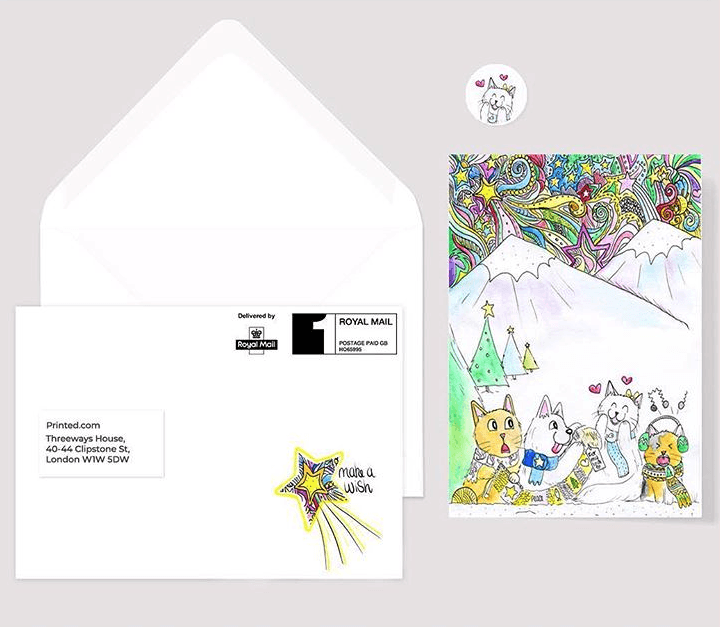 Michaela created her super cute designs for Mind Charity. Happy Pawtraits design features some happy pets up to mischief as always. Created for Action for M.E, these fun cards are bright, bold and beautiful! Sally Howden’s entry not only looks great, it’s inspired by Christmases past… She says “my favourite part of Xmas is decorating the tree but I hate “Last Christmas Me” for just balling up the lights…” Her chosen charity would be Birmingham Children’s Hospital for all their hard work. Illustrator, painter, artist and designer, Hannah Clark, created this intricate wreath design for our Goodwill Competition, and we think it’s absolutley stunning! 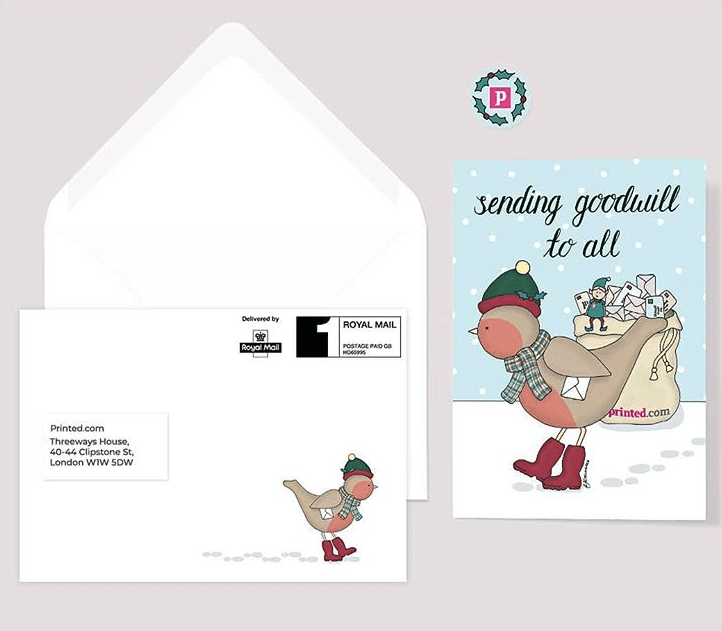 Wren and Rose took a traditional approach with their deep, luxurious card design, in aid of DDougie Mac Hospice. 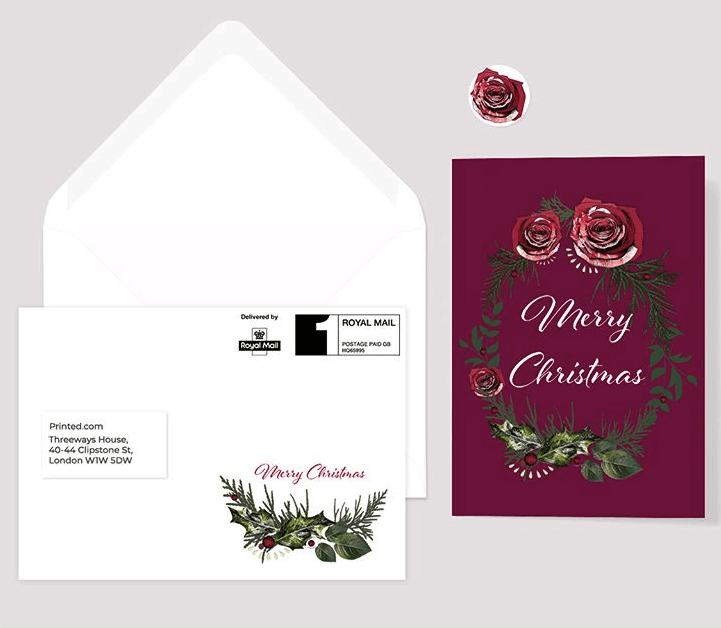 We love the rose sticker as a finishing touch! We have to say, we laughed ALOT, when we saw this card. 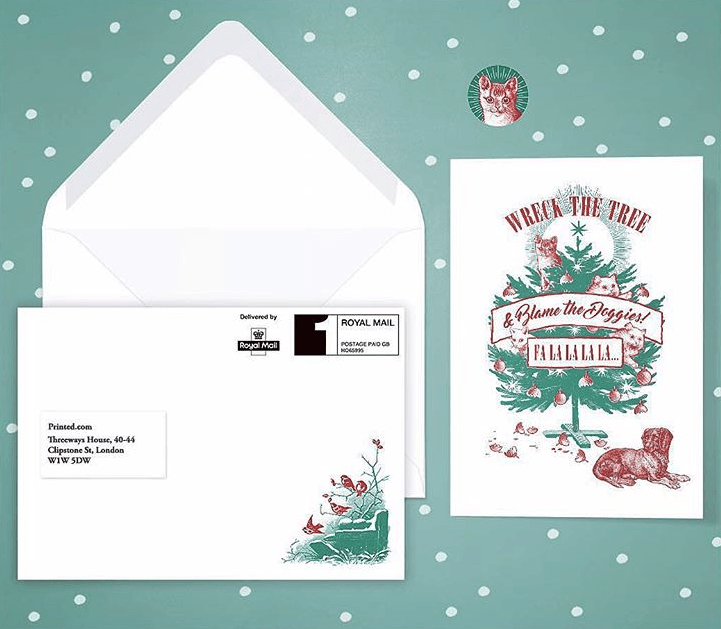 As anyone with pets will know, Christmas trees and animals aren’t exactly a match made in heaven… Th innocent cat sticker for the back really finishes the deal too – we can just imagine it saying ‘who, me?’ They were created for Brains Trust UK. Oh yes Sarah, please do bring us the figgy pudding! 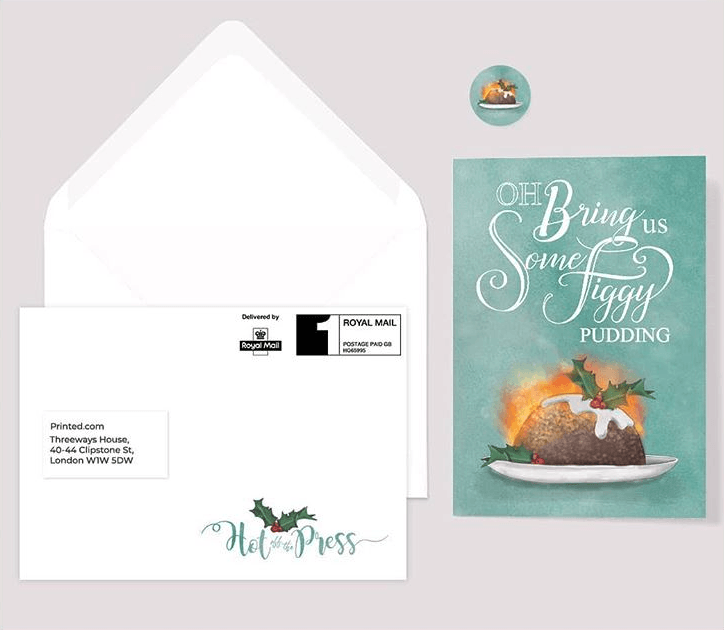 Although, now we’re hungry… and all we want is Christmas cake… in October… Her fun design was created for Velindre Fundraising. 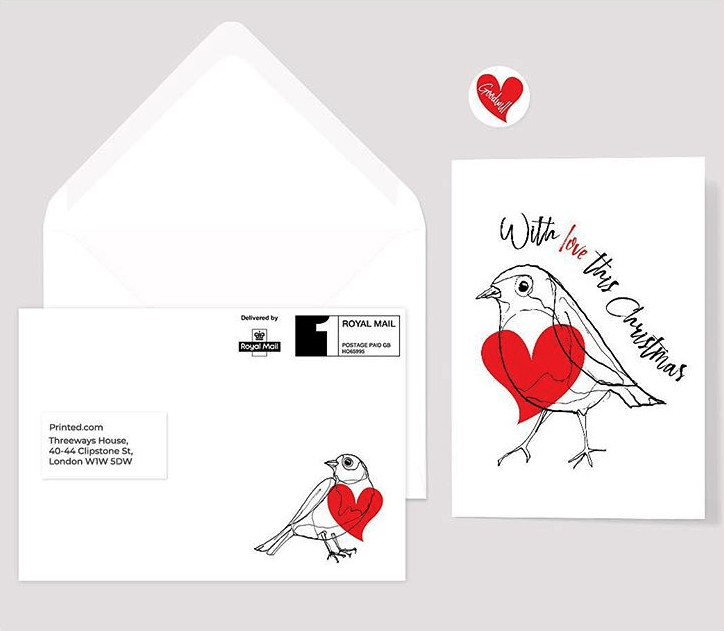 Sending love in the form of an adorable hand drawn robin, Origin Bespoke’s cards were created, fittingly, for the British Heart Foundation. And that’s it! It’s a wrap. A huge thank you to all of the designers and creative’s who entered, we truly loved all of your designs and believe us when we say it wasn’t easy to pick a winner! 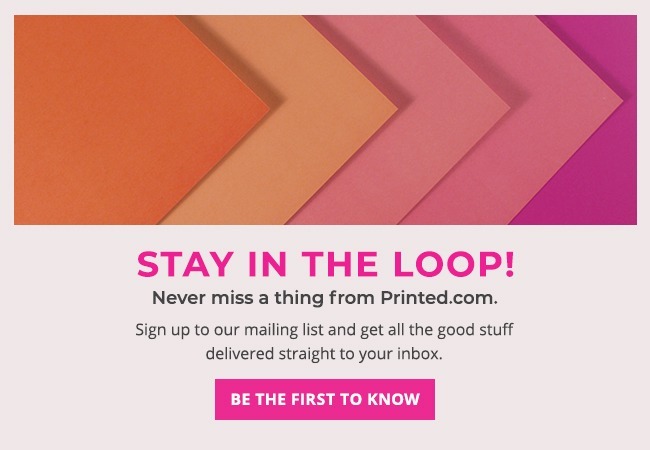 We hope to see some of your fab designs coming through our presses soon! 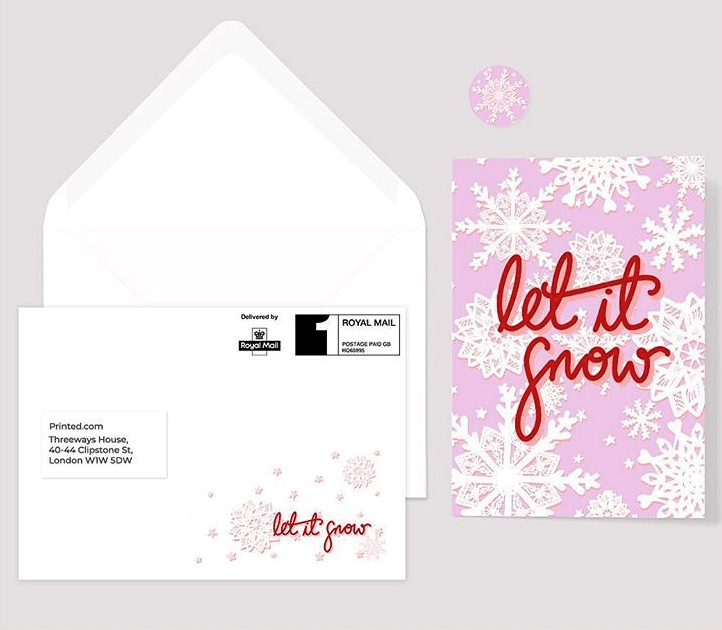 Missed out on the #PrintedGoodwill Competition? Head on over to our social channels and give us a follow to be in with a chance to get involved with the next one. Oh, and don’t forget to keep tagging us in your printed creations using #ProudlyPrinted for a chance to get featured on our Blog!